The “spatial data processing and decision support system” team are tasked within the program to develop a web-based Spatial Decision Support System (SDSS). But what is a SDSS and why is this important for precision viticulture? Precision viticulture is based on the collection of raw spatial data, its transformation into spatial information and the generation of good viticulture decisions for spatial or site-specific management. Site-specific management is not a new concept, but there is still a lack of adoption by commercial producers and one of the reasons for this is the absence of SDSSs. SDSSs are needed to provide users with the right decision-making environment that allows for the management of spatial data in a flexible manner. Decision makers with a complex spatial problem often have multiple conflicting objectives when determining a solution. They need a system that lets them define the problem and articulate the objectives for its solution. - first the problem can be explored to increase the level of understanding and to refine the definition and, secondly, the generation and evaluation of alternative solutions enables the decision maker to investigate possible trade-offs between conflicting objectives and make a decision based on the grower’s attitude to risk. A support system should facilitate the introduction of new factors into analyses and also the relative importance of factors in analyses, both to evaluate the sensitivity of solutions and to reflect different opinions and objectives for the solutions. Finally a system should be able to display the results of analyses in a variety of ways that help users to understand them. For this project we decided to develop the SDSS for the US viticulture industry with open source Web technologies because they are free to use and they allow easy management of the diffusion of decision support tools, their update, and communication with centralized databases. The Figure below shows an overview of the SDSS under development. This is a prototype, therefore the software components may be replaced as the project proceeds. Basically the prototype is modular and will contain a presentation layer, a business layer, a GIS layer, and a data/analysis layer as independent components. The presentation layer will include the interactive web application that runs on the user device; both desktop and mobile devices will be supported. The business layer management system will supervise the modelling and analytical capabilities of the system including the generation of web pages for the presentation layer. The GIS layer will contain the tools necessary to distribute spatial data using industry standards; in particular the interaction with the data/analytical layer will employ “Web Processing Services” which define standard rules for exchanging spatial data between different software. The data/analysis layer will contain the tools for storing, processing, and analysing the user’s spatial data. 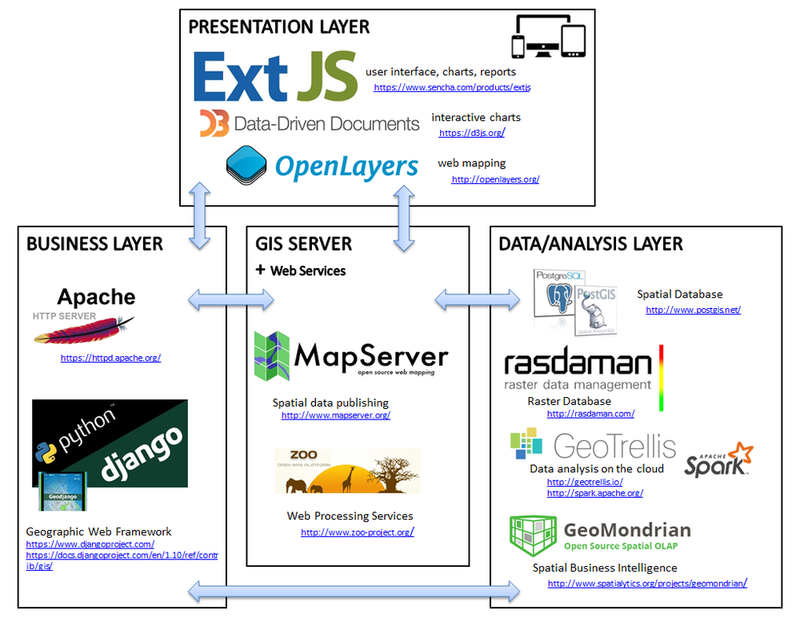 The main tool for this layer will be the spatial database which allows permanent storage and query of spatial data; however other tools may be employed to enhance the analyses of images and maps, the storage of large quantities of data, and the conversion of raw data into meaningful and useful information for spatial business analysis purposes.